In March 2009, Coastair, a subsidiary of Ashburton Air Services Ltd (AAS), announced their intention to commence Christchurch Westport/Greymouth flights on Mondays, Wednesdays and Fridays using a 12 seat Cessna 404 Titan. 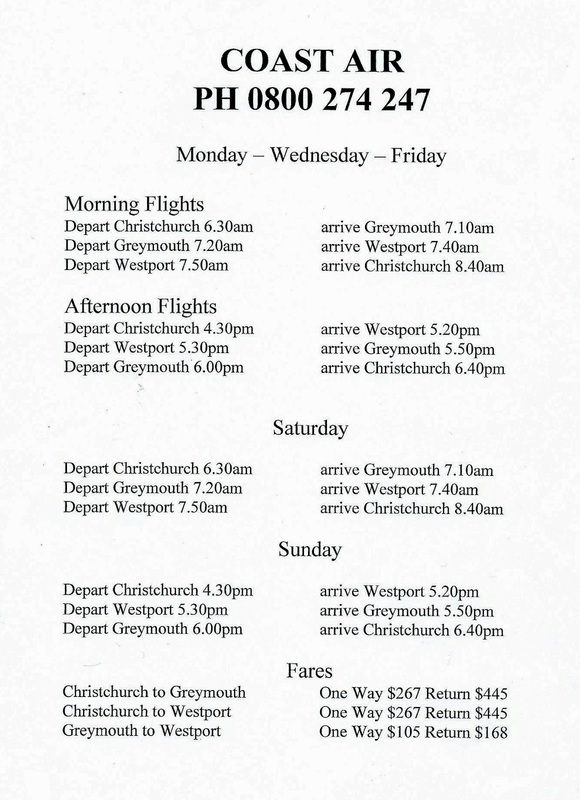 The initial timetable had flights departing Christchurch at 6.30am, arriving in Greymouth at 7.10am and Westport at 7.50am with the aircraft then flying direct to Christchurch arriving at 8.40am. The afternoon schedule envisaged a flight leaving Christchurch at 4.30pm arriving in Westport at 5.20pm and Greymouth at 6pm before returning to Christchurch. Weekend flights were also planned offering flights leaving the Coast on Saturday mornings and returning on Sunday afternoons. The company was particularly looking to large employers such as Holcim and Solid Energy to be major users of the service. Fares were not cheap. 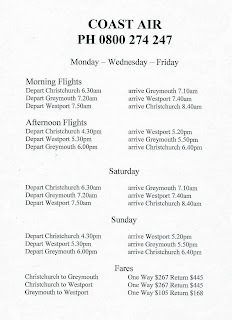 A one-way ticket from Greymouth to Christchurch was $267, and a return ticket $445. However such fares enabled the company to break even with just 3.8 return passengers per flight. Terry Hewitt, Coastair’s chief executive, told the Westport News that idea for the service came from a pilot who was on holiday in Westport. The owner of the Westport motor camp suggested to him that the company look at flying out of Westport. At this pre-launch stage the company stated they would look at adding a Greymouth-Wellington service if the service proved popular. Flights began on 8 April 2009 with Titan ZK-NDY flying empty to Westport with two passengers taking the return flight back to Christchurch. The service was slow to take off. On the 22nd of April the Westport News reported that only 8 of a scheduled 12 flights had been flown, none of them landing at Greymouth. However business did start to pick up and in July the company reported that loadings had picked up to six passengers or more on Monday and Friday flights. The company had been considering extending the service to five days a week. Such reporting, however, was in the light of Air New Zealand’s announcement on the 8th of June that it would operate a twice daily Christchurch-Westport return service on Mondays and Fridays using Eagle Air Beech 1900s. Air New Zealand said this service had been negotiated for some years with Solid Energy who would subsidise the new service by guaranteeing minimum seat occupancy per flight by Solid Energy staff, consultants and contractors. The arrival of Air New Zealand with fares as low as $84 effectively spelt the death knell of the Coastair service. Coastair accused Air New Zealand of predatory behaviour and of putting up a loss-making venture to eliminate the competition. 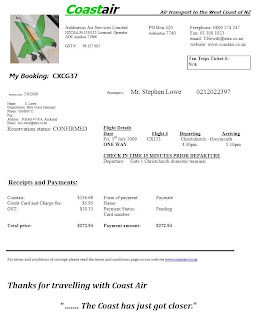 In early July, with the imminent arrival of the Air New Zealand Christchurch to Westport service on 6 July 2009, Coastair’s forward bookings looked bleak. So it was no surprise when the company flew its last service into Westport on the 6th with three passengers. The Titan then returned to Christchurch empty. Subsequent to this various reports in the West Coast newspapers talked about the possibility of a Greymouth-Wellington service with speculation that Hokitika might also be included. Such a Greymouth-Wellington service featured briefly on the company’s website but on 25 July it was reported in the Greymouth Evening Star that the cost of setting up such a service was excessive as would have been the $600 fare. The company has now returned to concentrating on charters throughout New Zealand. Coastair's Cessna 404 Titan at Greymouth on the last of the rare occasions it stopped at Greymouth on 3 July 2009.